The Leading Ladies and Gents. ........That's what they are to you. But to the rest of the world, they are your bridal party...They are the men and women who get first class seats in the rollercoaster plane ride that takes you to the new phase of your life. 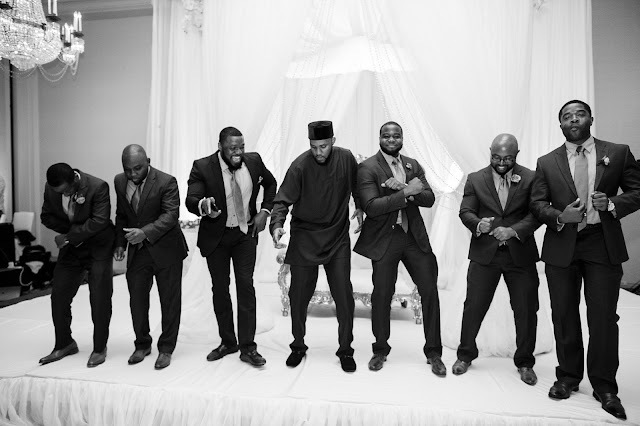 Over the years, growing up, most of us have joked about it to our friends, "When I get married, you must be in my bridal party o!" But as with all things in life, we all get pulled in different directions, friends evolve and so do you. While you may still be in touch with the set of friends you had at 16, you will find that they may not all still be the ones you want standing next to you when you make the ultimate commitment. In theory, choosing this group should be exciting and a no-brainer. After all, this is a great opportunity for you to choose your favorite people! In reality, the process of choosing your wedding party can be stressful. You want everyone in your life to feel special on your big day but you CAN'T choose everyone. Between siblings, cousins, in-laws, high school friends, college friends and friends you picked up along the way, if you chose everyone, you won't have any wedding attendants. So accept this and don't stress- At the end of the day, true friends will understand if you don't put them on the train. From the perspective of a 10-time bridesmaid and having recently been a bride, here are some tips to help you choose the team that will make your wedding everything you dreamed it to be. Once you ask that question, you can't take it back. So, make sure you really want this person to be in your train before you ask them. Listen to your instincts. If you have any doubts about any one person or think you are asking just because they will be angry if you don't, then table it, until you are comfortably secure. Your wedding will only happen once and it is not a time for risk-taking. You have to pick the right people. You want to look at your pictures years from now and still be able to say, "That's my person!" 2. Don't Choose Out of Obligation. I can't say this enough- PICK people YOU actually WANT in your train. Don't pick anyone just because you feel obligated to. Just because you were a bridesmaid in their wedding, doesn't make you obligated to pick them as well. From experience being on so many bridal parties, it is an easily regrettable decision. Like I've discussed in previous posts, a recurring theme in wedding planning is that everyone has an idea of how YOUR wedding should look. Especially your family. Don't pick a cousin because your mom says so. You have to want the person on your train. One of the weddings I was a part of, two of the bridesmaids who were actual cousins of the bride were turning up their nose, gossiping and snickering at the bride the entire day. I was so utterly disgusted. And of, course as a Nigerian, if you have a lot of family and friends who you can't all put on the train, there's the option of ashebi/asoebi. 3. Pick People Who Want to Do it FOR YOU. Being on a bridal party is no longer a cake-walk. The bridal party is expected to selflessly serve the bride and groom. So, you want people who want to be on your train. If you have any inkling that someone is hesitant to do it for you, cut them out. One of the bridal trains I was part of, the bride seemed to have put together a group of girls who had a specific "look". Unfortunately, most of the girls on her train were more concerned about flirting with the groom's friends than being there for the bride. Some others were more concerned with their makeup than with making sure the bride's own makeup looked good. In another wedding I was part of, some members of the bridal party sat through the entire day with the "I didn't sign up for this". Others were more interested with hanging with their boyfriends or friends, than with the bride and groom. Choose people who love you and want to be there for you. I can't tell you what some of my bridesmaids had to do to be there for me because it may just make me tear up..... All I'm saying is...Choose wisely. 4. Pick The "Right Kind" of People. Before you pick your bridal party, be honest with yourself about your expectations. When you decide what they are, then pick people who love and care about you enough to live up to them. Choose people who will be are genuinely happy for you and who will be your support system. Trust me, when I say, my bridal train made a difference in making our day what it was. Picking our team was one of the best decisions G and I made. They showed up that morning on time AND got along. My make-up artist even commented that it was one of the few bridal suites she has been in that seemed more of a party than a dramatic snub-fest. Shoutout to the wedding party Obs, Ogs, Nazo, Dera, Ada, Jules, Ije, Norr, Ozo, Naa, Vivian, Amauche, Nicholas, Michael, Nnadozie, Eric, Charles, Nze, Joel, Kennedy, and Emeka. They came to serve AND party! They filled gaps G and I didn't even know were there. We had a real turneddd-up party for our wedding party and every one of them who were there made it all worth it. Thank you guys! We love you! 5. The More Isn't Always The Merrier. If you want a large train AND you have enough good people to fill it, please do it. I did it and loved every minute of it. But if you are only sure of five people but want a big train, please reconsider. I had a large wedding party but that's because I already have four sisters and still had enough loyal people to fill up two party buses. But its better you have five sure people who will make your day special than to have ten people, half of which you're not sure will even show up that day. In the same light, even bridal parties are outdated. There's no law that requires equal men and women. Do not feel the need to have 9 bridesmaids just because your fiancé has 9 groomsmen. Uneven bridal parties will not be the worst thing that can happen on your wedding day. There are various ways to cover up for it. One of my bridesmaids Ije had to walk out of the church with two groomsmen and the comical way she handled it had the guests reeling from laughter. Again, four sure birds in hand is better than five with one flaky. The one bad seed can cause you enough drama to overshadow of the goodness of the four you actually wanted. More so, the bigger your bridal party, the more expensive for you. Everything I bought for my bridesmaids, I had to buy at least 12. It wasn't cheap but I knew it was worth it. Do same. 6. Family is Always Surer. No matter what any one says, blood is still thicker than water. Friends can come and go but family will always be family. If you have sisters and cousins you are close to, Use them before friends. If your fiancé has sisters who are willing, make them part of it. They'll always be there. Like I said earlier, over the years, I've had endless lists of who and who are on my train- sadly the lists change almost every year. Loosing friends is a given. For some reason, weddings provide ample room for you to shed friends but that's a story for another post. My point is simple: family is priority. Last but not least, this is YOUR day. Make it what you want to be. When it comes to choosing the people who will stand beside you, "traditional" rules don't really matter. Mix it up how you want. You know your friends, so give them roles to fit their personality. You want two maids of honor? Go for it! You want two matrons? Why not! You want to create a special title? It is your day, isn't it? Just split the responsibility how you deem fit- who will hold your dress keep your bouquet, stand next to you, light the candles, etc. and communicate it to them. Within my bridal train, I made a cocktail that was perfect FOR me. 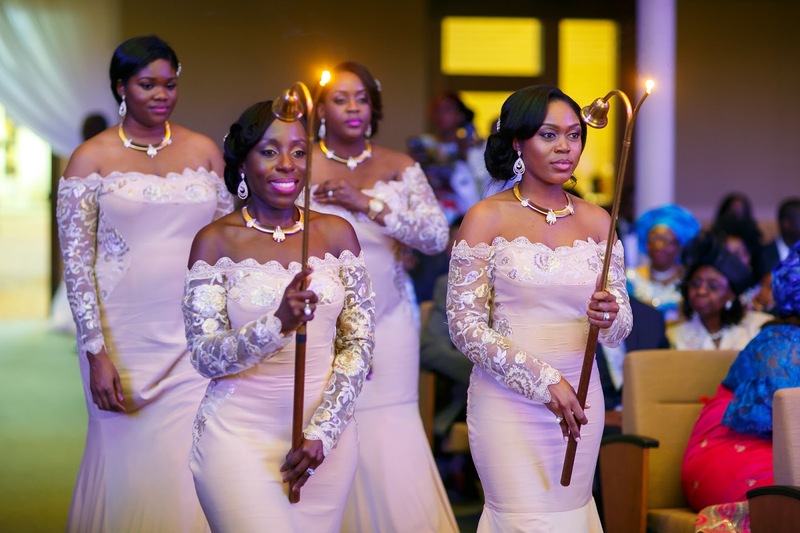 I had two maids of honors, two matrons of honor, five bridesmaids, and four "Sisters of the Day" who did the lighting of the candles and had on special dresses. It worked out perfectly. Make your cocktail to taste- and Enjoy! P.S. : After you make your choice, don't assume your bridal party knows what their responsibilities are. Some may not have ever been in a bridal party. More so, every bride and groom is different. So, make sure to communicate your expectations. That way, they know what to do! Best of Luck! And ofcourse, if you're a bride-to-be, and you have questions, don't hesitate to reach out!